Are you looking for the best way to communicate your values, experiences, insights, beliefs and personal information for future generations? 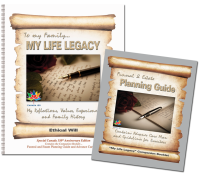 Sometimes called an "ethical will," the completion of a legacy journal is a great way to preserve the essence of your life. Fill out the form below for an informational PDF.